It is not my goal in this piece to claim that these ideas reflect the filmmaker's intent. It's my goal to use these ideas to demonstrate a lens with which to watch the film that may illuminate new possibilities and help extract previously unseen commentary and significance. During the summer of 1835, Charles Darwin disembarked the HMS Beagle four years into an expedition to circumnavigate the globe, and he stepped out onto the Galapagos Archipelago. The Islands being so cut off from the South American mainland and each other (the Galapagos Archipelago is comprised of thirteen distinct islands) meant that it hosted a myriad of species that couldn’t be found anywhere else on the globe. After collecting and documenting thirteen different species of finch across each of these islands, Darwin left the region and didn’t deliberate much on his findings until he arrived back in London the following year. Upon re-addressing these species, it became clear to him that something unique was happening on the archipelago. While there were thirteen different species of finch, they all appeared to be adapted from a single, ancestral species that had migrated from mainland South America. From one ancestral species to thirteen, with distinct physical and behavioral characteristics adapted for the different environments on each island—tree or ground dwellers; seed, insect, or cactus eaters. This adaptive radiation across the island chain shows us that slight divergences in genome grant certain finches advantages that improve their chances of survival. Given time, this process produced an array of distinct species. In a post-On the Origin of Species world, it’s hard to comprehend the incredible power of this revelation. What’s important to consider when discussing the theory of evolution is that it’s not a precise formula—it’s a set of causal elements that, given time, produce changes that give rise to new species. Darwin described the process of evolution as, “natural selection”; language that might imply some sort of unknown, unseen, "selective" force. Because of that action-oriented language many adopted the term, “survival of the fittest,” but even with this change in nomenclature, we’re still struggling with how that term exactly describes human behavior. 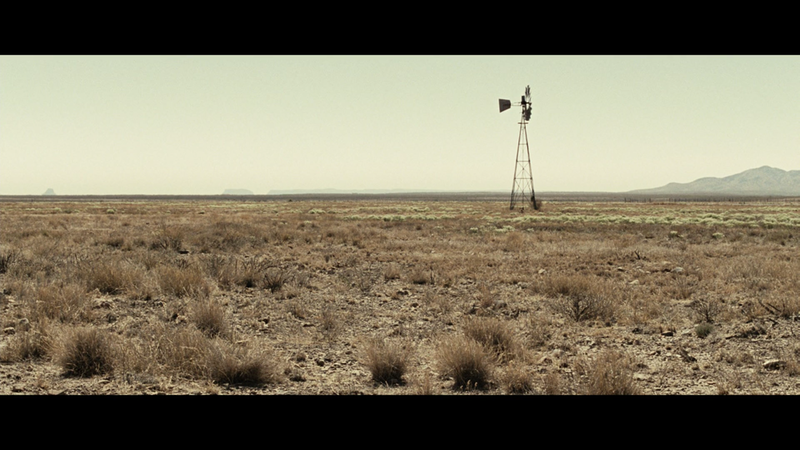 The Coen Brothers’ No Country For Old Men is a relatively faithful adaptation of Cormac McCarthy’s novel of the same name. While the film does differ in some key areas, it echoes the novel’s thematic elements to the point that they resonate similar conceptual tones. The film starts with a somber monologue delivered by Sheriff Ed Tom. The burden of a time, and the feeling of a world gone mad clearly weighs on him. Footage of the Southern Texas sun rising across the wilderness accompanies his musings over the past. The sun continues to rise, as he imagines these old sheriffs in modern times. The sun now beats down on the plain, and heat waves ripple along the horizon as Ed Tom tells a story about a boy he sent to the electric chair. We see the world start in this, pre-dawn period where the desert is cool and welcoming and once we get to his discussion of the violence of modern times, we're in the scorching, unforgiving desert. Before Anton Chigurh (Javier Bardem) wraps his handcuffed arms around the deputy’s neck and throttles him, we’re unable to even see his face. He sits in the shadows of the police cruiser and well behind the deputy as he’s making a phone call. In fact, the first good look we get at his face is almost ten seconds into his murder of the deputy. We see him grimacing with effort, eyes open wide; a crazed killer, throttling the deputy on the floor. Our introduction to Anton puts his most salient qualities first—he’s more ghost than human and he’s an incredibly capable and efficient killer. 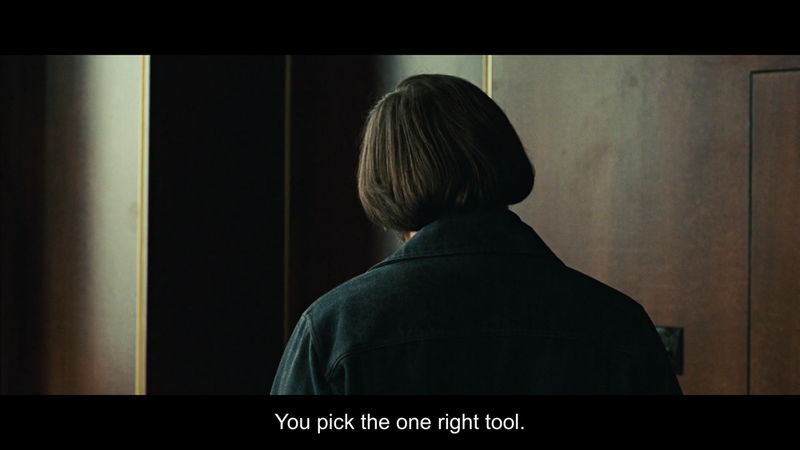 Chigurh is a killer, but the tool he uses and he way he kills are far more important than the fact alone. He murders humans like livestock. A Texas Pronghorn is in the crosshairs of Llewelyn Moss’s (Josh Brolin) rifle. He makes an adjustment to his sight, and fires. The bullet makes contact, but it’s not a killing shot. The Pronghorn limps away. Moss picks up the used cartridges and puts it in his pocket. In the first six minutes of the film, we have an array of speciation between these three men that end up gravitating around a single event—an, “O.K. Corral” shootout, drug deal gone bad in the desert. When Moss comes across the scene and trades his bolt action rifle for the automatic H&K he finds by a dying drug runner, we starting seeing exactly what it means to be, “part of this world” as Ed Tom would put it. 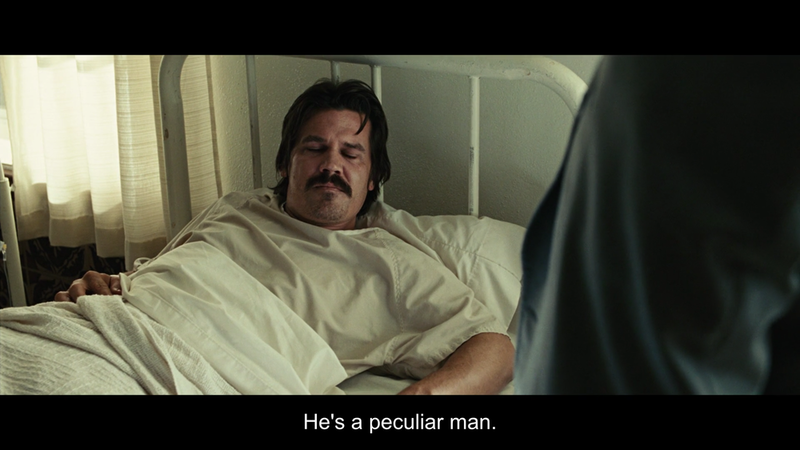 That is, the world that Chigurh exclusively inhabits. This form of rugged individualism defines No Country for Old Men. Sheriff Ed Tom begins the film talking about these idyllic fixtures of the American West—he talks of men that stood so tall, they had no need to wear firearms to police their dominion, and yet he sees a changed world. A world that’s been changing while he and his predecessors were on the clock. Moss is an especially capable man, and over the course of the film, demonstrates his astounding ability to survive. It’s hard to imagine a more perfect picture of American individualism than Llewelyn Moss, a straight shooting, rough and tumble war veteran and retired welder who survives through multiple firefights and gunshot wounds. He’s a man best adapted to life on the lam and yet, after evading Chigurh, and nearly killing him, he’s gunned down by gang members at a motel in El Paso, Texas. After all of the incredible effort he put forth, we don't even see his death on-screen-- there's no glory in it. And you must ask yourself, what ability does a man need to be naturally endowed with to survive in this world? How can a man like Moss meet an end like this? Ed Tom stands in the morgue, staring down at the lifeless corpse of Llewelyn Moss. We never see a close up of Moss’s body, all we get is Ed Tom’s grave face. Throughout the course of the film, the Sheriff has seen so many other dead bodies, but this time, he takes a breath, as if holding back nausea. Ed Tom laughs it off as a joke in the moment, but when he’s approaching Moss’s trailer, him and his deputy notice the lock’s been punched in. 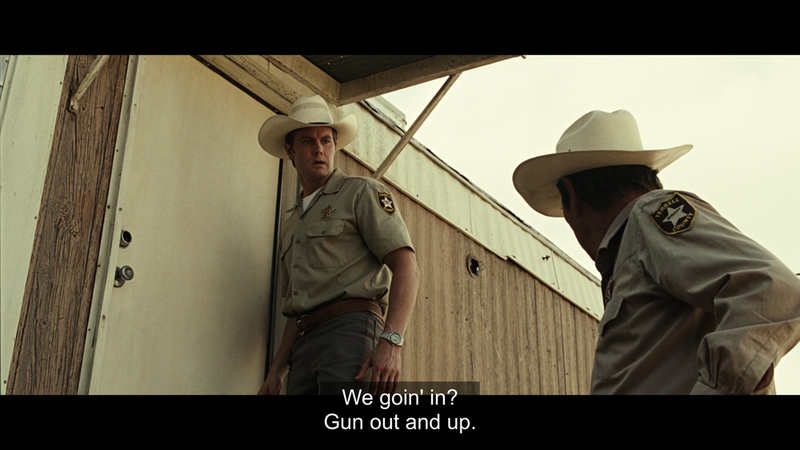 “We going in?” The Deputy (Garret Dillahunt) asks. “Gun out and up.” Ed Tom responds, but he doesn’t reach for his pistol, he stands there as the deputy draws his weapon. 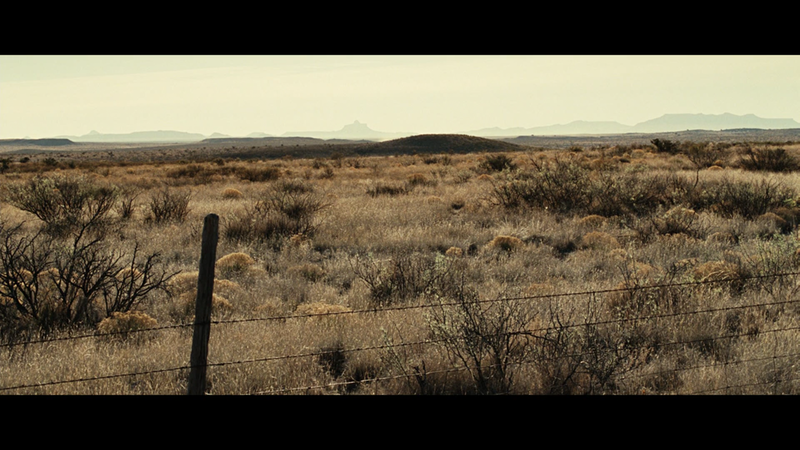 The violence that Ed Tom describes in his opening monologue, personified by Chigurh creates a gravitational pull of which he lingers on the outskirts. He comments on and trails the consequences left in it’s wake, but refuses to descend into it. Chigurh, the black hole at the center of that gravitational field, goes on a monumental killing spree throughout the film. Brutally murdering almost every person that he comes across. 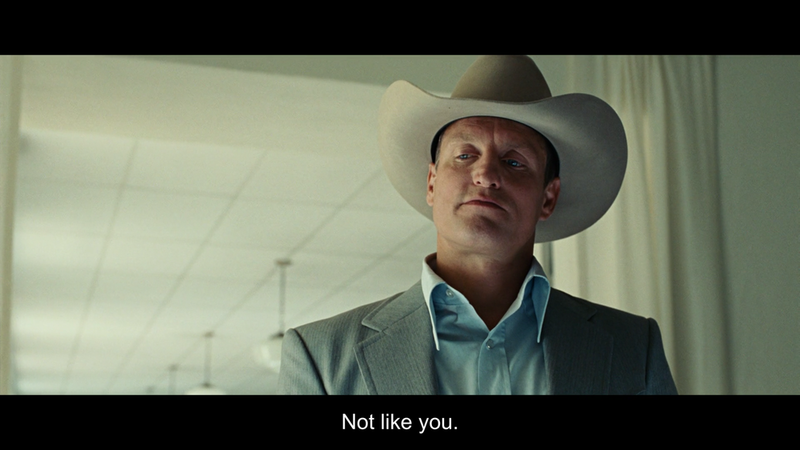 At one point in the film a man asks Carson Wells (Woody Harrelson), just how bad is he? It’s easy to just see Chigurh as a personification of death itself, as many writers have done previously, comparing him to Bengt Ekerot’s portrayal of Death in Bergman’s The Seventh Seal. But Chigurh is more nuanced than that might imply, because he doesn’t commit these murders in involuntary urges, without a plan. He does it out of an ethic that ensures that his brand of violence will continue to be necessary. While Chigurh is the main antagonist chasing Moss, he’s also being tailed by a group of drug runners hired to track down the money. Chigurh’s transponder guides him to a roadside motel where he unknowingly bursts into the room where the Mexican drug runners are staying and murders them all. He finds that they have a transponder too. Much later, we find ourselves in the office of the, "managerial" man (Stephen Root) who hired these Mexicans. 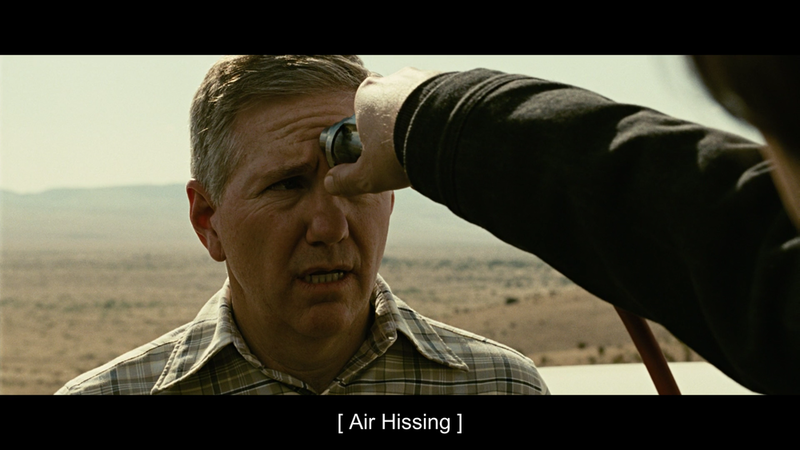 Chigurh bursts into the room and fires a killing shot directly at the man. He falls to the ground, gurgling in his own blood. An accountant is in the room, slightly shaking after seeing Chigurh murder his boss, and stand over his body. While Darwin’s theory of evolution can be reduced to a set of questions with objective answers, the theory is much more complicated than that. When observing the finches in the Galapagos, it’s almost impossible to argue that the deviations created simply for survival were not for the good of the species. In fact, the species itself would not exist without these mutations and speciation—their survival is intrinsically handcuffed to it. Because of this, Darwin often spoke of natural selection in terms that would imply that it’s a force for good. For the surviving party, this is an easy argument to make. The diversity of Darwinian analysis is virtually never-ending. It’s easy to showcase the animal kingdom through the lens of Darwinism, but Darwinism has also found a place in philosophy, where people use this way of thinking to discuss ethics. Some philosophers have gone so far as to say that a Darwinian outcome (that is, survival) supersedes all other outcomes. Have a good time arguing that point, if you wish. That being said, do the trillions upon trillions upon trillions of processes that have created our trillions upon trillions upon trillions of cells, that have given us the ability to survive from the apotheosis of man’s consciousness to this very moment, give us the ability to accurately judge morality on that very basis? Putting it plainly: Does survival of the fittest always work for the moral good? And does the Darwinist ethic of natural selection judge the loser correctly? Carson Wells, a charming man, also hired to retrieve the money finds Moss, immobile and hospitalized in Mexico. He offers protection for Moss in return for the money—he even offers him some of the money. Wells treats Moss as another human, going so far as finding common ground regarding their military service in Vietnam. Because of the violence that has preceded him, Moss is rightfully cautious, rejecting his offer and throwing verbal jabs at him despite Wells’ surprising humanity. As Wells walks up the staircase of his hotel, Chigurh follows. 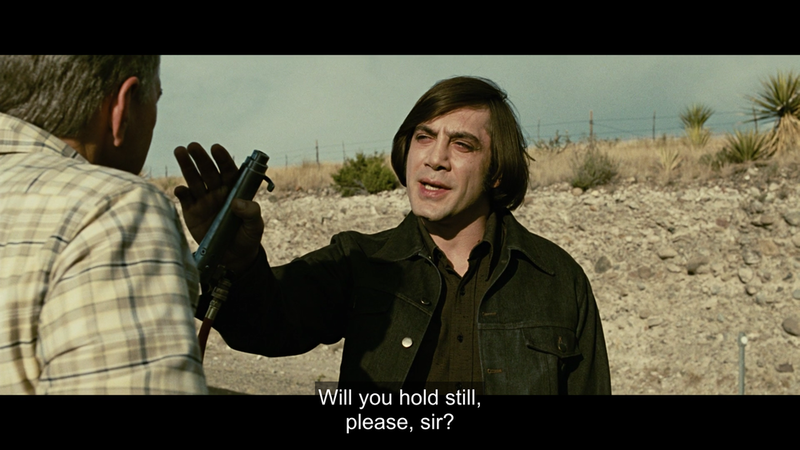 Wells stops, and Chigurh directs him to head to his room. Chigurh sits across from Wells, aiming a shotgun at him. Wells tries to reason with him, offering money. Chigurh smiles and nods. Wells offers him money, and says he knows where the satchel is. He doesn’t budge, and Wells knows Chigurh enough to know what’s going to happen. Chigurh argues that Wells’ method of operation is inherently flawed, because of the end that he is meeting. Needless to say, Chigurh survives the altercation. Sheriff Ed Tom stands outside the motel room sectioned off with crime scene tape. The lock has been punched out—he knows what that means from prior experience. In the reflection of the brass, he sees the faint suggestion of a person on the other side. Chigurh, almost entirely concealed by darkness, waits like a ghost on the other side of the door. Jones' performance in this scene conceals whether or not Ed Tom knows for sure what awaits him and yet, uncharacteristically, he draws his pistol and enters the room. The place is empty. He holsters his pistol and breathes a sigh of relief, but then he looks to his left. The grate covering the air-conditioning unit is off the wall, and the money that was surely hidden there, gone. Chigurh had been there, just moments before. A dime lays on the floor. Heads up. Ed Tom sees evil and chaos everywhere in the world and he thinks, "what is this world coming to?" He can't reconcile the mindless violence and so he holds onto these ideas of the past-- that the world has flown off the rails and the same rules don't apply anymore. Ellis recognizes this and reminds him, the world has only one rule and it's only ever had that one rule-- and you don't have a say in the outcome. Llewelyn Moss’s wife, Carla Jean Moss (Kelly Macdonald) walks into her home, and sees the first sign it’s not empty. The window’s open, the wind softly blowing the curtains. She opens the bedroom door and Chigurh sits in the corner, in shadow. She sits down and knows what he’s come here to do. 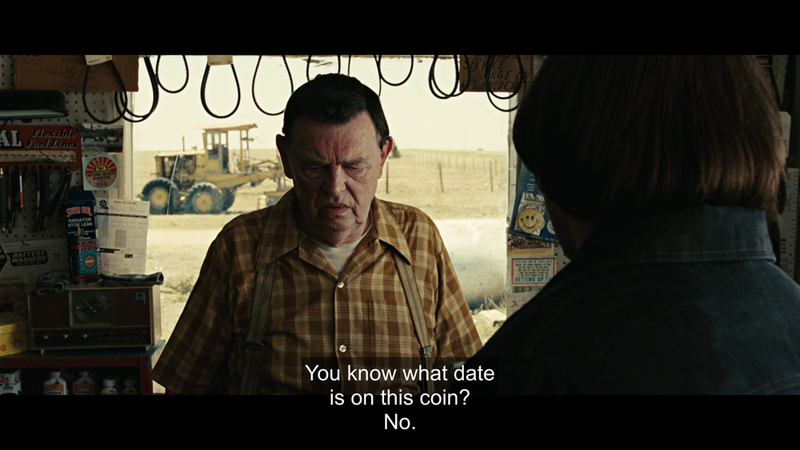 Chigurh pulls out a quarter, and flips it, placing his hand on top.